The Siemens SIMATIC S7-1200 is the controller for open-loop and closed-loop control tasks in mechanical equipment manufacture and plant construction. Due to the compact modular design with a high performance at the same time, the Siemens SIMATIC S7 1200 is suitable for a wide variety of automation applications. Its range of use extends from the replacement of relays and contactors up to complex automation tasks in networks and within distributed structures. independently customized products, systems and solutions for any aspect in automation and drive engineering, for a dependable operation under hard to extreme conditions. The Siemens simatic S7-1200 also increasingly opens up areas for which special electronics was previously developed for economical reasons. The new compact SIEMENS SIMATIC S7 1200 controller is at the core of our new present for simple but highly accurate automation tasks. The SIEMENS SIMATIC S7 1200 controller is modular and compact, versatile, a secure investment, and is perfectly suited to a whole range of applications. The SIEMENS SIMATIC S7 1200 CPUs with Safety Integrated handle both standard and safety-related tasks. A compact design with included IO, communication interfaces that meet the highest industry necessities and a range of dominant integrated technological functions make this controller an integral part of a comprehensive automation solution. The compact SIEMENS SIMATIC S7 1200 system content of different CPU (PLC) performance classes: CPU 1211C, CPU 1212C, CPU 1214C, CPU 1215C and CPU 1217C and two failsafe versions CPU 1214FC and CPU 1215FC. Each of these may be extended according to the machine requirements. The SIEMENS SIMATIC S7 1200 CPUs can be expanded with up to three communication modules (CM) and eight signal modules (SM). Signal modules and signal boards can be integrated in order to expand the digital or analog IOs without affecting the physical size of the controller. Signal modules can be connected to the right side of the CPU to further expand the digital or analog IO capacity. CPU 1212C accepts two, CPU 1215C and CPU 1217C accept eight signal modules. All SIEMENS SIMATIC S7-1200 CPUs can be equipped with up to three communication modules on the left side of the controller – this enables seamless serial communication and the use of various distributed IO devices. 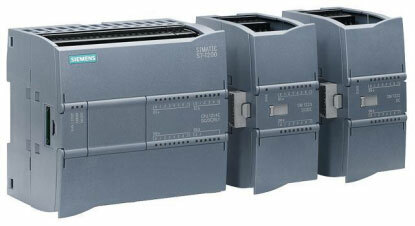 M/s Grups Automation, Exporter and Manufacturer of High Quality SIEMENS PLC S7 1200. We have successfully completed installations and can provide better after sales services in following countries / Cities.